The future of archeological collections management also includes dealing with and taking advantage of new technologies. This includes the use of the Internet, computerized databases, CD-ROM, and digitized records, all of which are rapidly changing. In order to use the information and resources made available by these technologies, repository staff, archeologists, CRM managers, and others must spend time, expertise, and funds to keep them up-to-date. This is done by moving them to newer hardware and software as standards change. In-house Databases: Computerized technologies are becoming widely used by repositories for in-house collections databases, which allow for relatively "quick" cataloging and inventorying of large collections through a standardized set of data fields and terminology. They also promote quick and efficient storage, sorting, and retrieval of data. This is especially useful for researchers, as well as for repository staff, who need to find particular items and conduct inventories. More readily available information about the collections also allows for better accountability and budgeting for their care and management. However, many repositories have sizeable cataloging backlogs that will take time and money to eliminate as they also work to keep up with demands to catalog new collections. Unfortunately, the development and use of in-house databases for objects has not been accomplished in any systematic way. Many repositories have used several types of cataloging systems through the years. Sometimes, the data collected is changed by adding new data fields and/or expanding or contracting the list of authorized terms. With each change, data may have to be reentered, which is a serious duplication of effort and may lead to errors in data entry. It may also mean that the cataloging or inventory information gathered differs within a collection or between the collections held by a repository. Furthermore, databases require long-term maintenance of software and hardware. With computerized technology changing as rapidly as it does, this need to keep updated can put a large strain on a repository's resources. Archival description databases, on the other hand, have been systematized--they are collecting the same information in the same ways. Archives across the U.S. are now using system, terminology, and syntax or style standards, finding aid standards, and content and mark-up standards. The long-term implication of this coordinated practice is that, as archives make these databases available on the World Wide Web (see below), researchers and other users can search for materials housed in different archives using the same search terms. This has already begun through the use of national bibliographic utilities, which permit searching across the holdings of many archives, libraries, and other repositories via the Internet. For example, the National Union Catalog of Manuscript Collections, provided by the Library of Congress, is a searchable database of descriptions of archival manuscript collections housed across the U.S.
CD-ROM Technology: Archeologists, CRM contractors, repositories, and other organizations are also taking advantage of CD-ROM technology to provide a compilation of information and data, often on project results or repository holdings, that cannot be economically presented in the print medium. The ability to link between CD-ROM publications, which cannot be easily changed or updated, and those on the Web, which can be easily updated, is an additional plus of this medium. CD-ROM is also becoming widely used to archive digital information, including data, photographs, and text. Whereas the life expectancy of the file formats and software used to collect these data is usually shorter, recent research into the life expectancy of CD-ROM indicates that it should not be relied upon for long-term storage. This is both due to the costs of regularly scheduled migrations of the information to new hardware and software and to the environmental effects on the life expectancy of CD-ROMs. Phoebe A. Hearst Museum of Anthropology's online presentation of its archeological collections. Searchable databases of collection inventories or catalogs. Online exhibits that combine various media including text, graphics, video, and audio. Object type collections using 2-D or 3-D graphics. Repository documents, such as policies, forms, and research reports. Directories or portal sites to particular subject matter or data sets. Links between a collection and contextual information about the archeological projects that formed it. E-commerce, making it possible to buy museum reproductions and publishable quality photographs of objects and documents. There are advantages and disadvantages associated with using the Web as a major information resource. Positive features include accessibility to a wide audience from the user's home, work, local library, or school. This means that the user can get useful and exciting information via a virtual visit to a repository, which may be very significant to researchers located far away. Another advantage is that multimedia capabilities allow the integration of text, 2-D and 3-D images, video, and audio components. Web sites can also be updated quickly and relatively easily if information becomes stale or needs to be changed or expanded. Some potential disadvantages have to be weighed before a repository embarks on a major Web endeavor, however. The first is that engaging, informative websites are not cheap to develop and require serious maintenance. Consultation with a Web designer is important to help decide on the site's audience(s), content, and navigation. Also, since the Internet is still not available to everyone, it cannot be the primary vehicle to provide public outreach and education. Another problem is that the digital information conveyed on the Web can never truly replicate the original item. Looking at digitized pictures of artifacts and documents, often in low resolution, is not the same as looking at the items themselves. Finally, since the average Web site across the world lasts a mere seventy days, the durability and ongoing usefulness of Web-based information is a serious issue. Print publications, on the other hand, can usually be found in a library many decades later. Collections databases are another important tool that is increasingly being offered and used on the Web. These are valuable for researchers. Their public availability can raise several issues concerning what kinds of information can be freely provided, however. Some collections information is sensitive or legally restricted, such as the appraisal value of an item, its past owners, its donor(s), and the specific location of the archeological site from where the item came. There is also the question of what to do with non-standard information, such as handwritten notes, that appear in older catalogs. Some of this information may be valuable when researching a collection or item, but it may not be systematically included in Web-based databases, except in a notes or remarks field that is not easily searchable. Furthermore, repositories have to figure out the best way to link different types of information together to maximize access and use. This includes linking basic catalog information of an item with its image(s) and associated documentation, including final project reports. Another problem for researchers and other users is that it is difficult to determine relationships between object collections housed at different repositories. For example, it is virtually impossible to find all the collections created during a particular WPA project that are housed across the U.S. using one set of search terms. This is mainly because repositories do not use standardized data fields and terminology for cataloging object collections. This is not true for archival collections as mentioned above. Finally, online databases can increase requests from researchers, educators, interpreters, students, and many others for access and information about the collections. While accessing and using the collections is important, publicizing collections on the Web creates a greater workload for repository staff who may already be stretched to the limit. 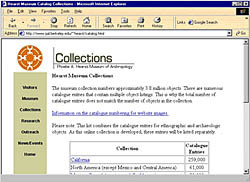 Collections are also being visited on the Web through online exhibits, which can either be used to increase awareness about an existing exhibit at a repository or can be unique to the Web. They are a distinctly different way of presenting archeological materials and information than 3-D, in-house exhibits, and have their own advantages and disadvantages. One advantage is that an online exhibit can reach a much broader audience than an in-house exhibit, which is limited to visitors who can travel to the repository. Online exhibits also pose little or no harm to the featured items, once a digital photo of the object or document is taken. Disadvantages to online exhibits include the inability of the user to get a true feel for the item itself, although improvements in 3-D imaging is quickly minimizing this problem. Another is that online exhibits can take almost as much time and money to create as a museum exhibit. Many repositories can only invest in one type of exhibit. 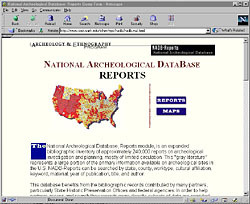 The NADB-Reports module is a searchable database of bibliographic information on reports of archeological investigations in the U.S.
Digitizing Records: Another important use of computer technologies is to digitize archeological records, reports, and/or their finding aids. This is important because of the relative lack of scholarly attention to this significant documentation in the past. It is also important as a means to increase access to the information these records contain. Having records available in digitized formats eliminates some of the accessibility problems that are usually associated with the archeological gray literature. determining where to make the data and reports available. Some of these decisions are easier to make than others. For example, there are existing bibliographic standards to use, such as the Machine Readable Cataloging (MARC) standards of librarians or the Encoded Archival Description (EAD) standards of archivists. The choices on how to make the reports and bibliographic information available is fairly limited to in-house databases, the Web, and CD-ROM. There are currently several efforts related to improving access to the archeological gray literature, dissertations, theses, and other works. The Digital Imprint project at the University of California, Los Angeles, is working on making archeological theses and reports available on the Web. A fundamental component of that project is to develop standards for digitizing large documents with images, figures, and other representations that can be used by all professional archeologists into the future. Another effort is the National Archeological Database, Reports module (NADB-Reports), a searchable database with approximately 250,000 bibliographic citations of reports and documents related to archeological investigations across the U.S. It has been available on the Web for over six years as an important first step to improving access to poorly accessible archeological reports. An early consideration of digitizing the reports cited in the NADB-Reports database was abandoned due to the exorbitant costs involved and the lack of a facility to do the digitization work. Thousands and thousands of archeological reports and articles exist from before the Computer Age. As technological change continues at its rapid pace, prices for digitization continue to drop, and most archeological reports are being produced electronically, however, this early hindrance is going away and access to the archeological "gray" literature may become easier and easier.